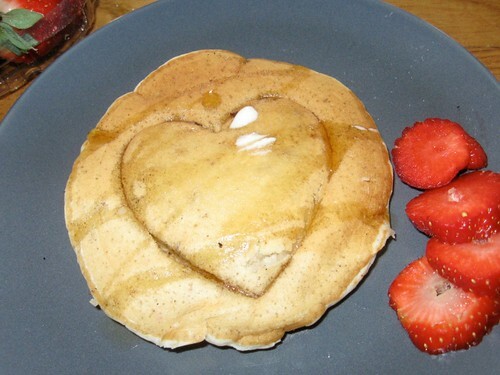 Pancakes and strawberries have always been a must for Valentine's Day. In the past I have actually poured them on the skillet into heart shapes. What a load of work that is! I was feeling lazy this year, so I imprinted each one with a heart cookie cutter. It actually turned out better than expected. For maximum effect, press the cookie cutter into the pancake as soon as you flip it. As the pancake cooks, it rises in the center. If you press your cookie cutter into it soon enough, the heart will rise. If you wait too long, the heart cracks.